If you walk around with your head in the clouds, come back to Earth long enough to visit Gainesville, Georgia’s, city parks. In addition to offering more than 400 acres of parkland, the municipal system features a Solar System Walking Tour. 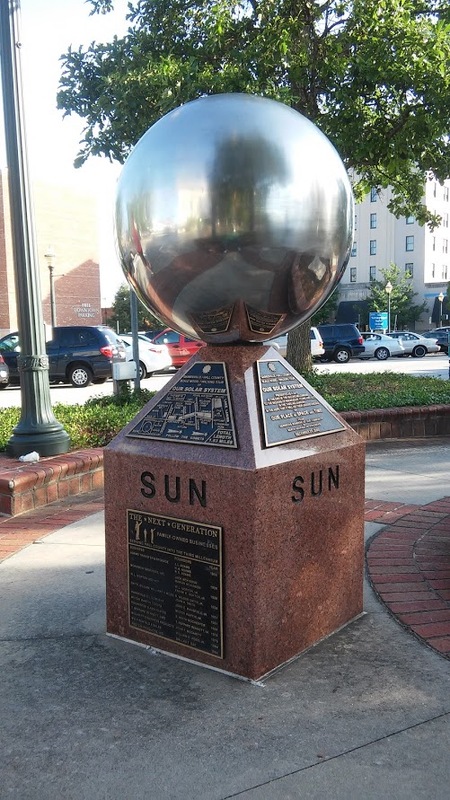 Visitors to the Downtown Square will discover a granite pillar, topped with a shiny model of the Sun, and a detailed map of the Solar System Trail. Not far are the planets Mercury, Venus and Earth, along with Earth’s Moon. Head toward Rock Creek Veterans Park and you will come into the orbit of Mars. 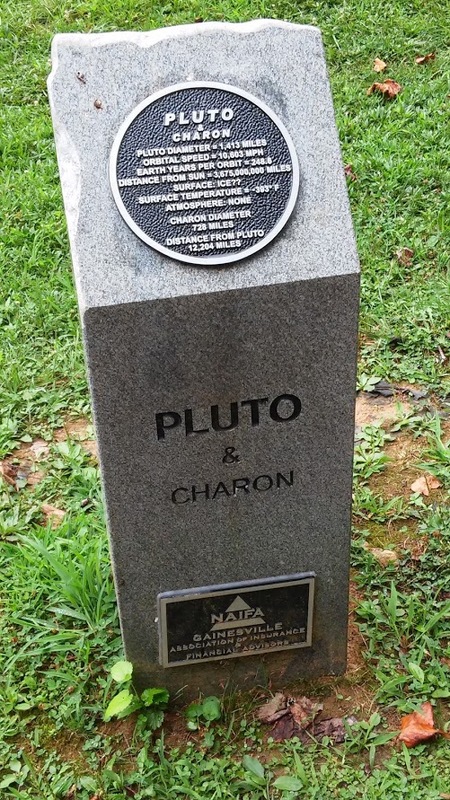 Jupiter and four of its moons are hidden nearby, and if you keep walking, you’ll make it all the way to Pluto (and Lake Lanier), but it takes more than a few steps. This scale model of the Solar System was created by the North Georgia Astronomers Group, who came up with the idea in 1998. Members partnered with local sponsors to raise money for the eye-catching granite pillars, which were erected beginning in 1999, as the astronomers’ Millennium Project. When the project was done, the planets, the Solar System’s Asteroid Belt, and Alpha Centauri were all in place. 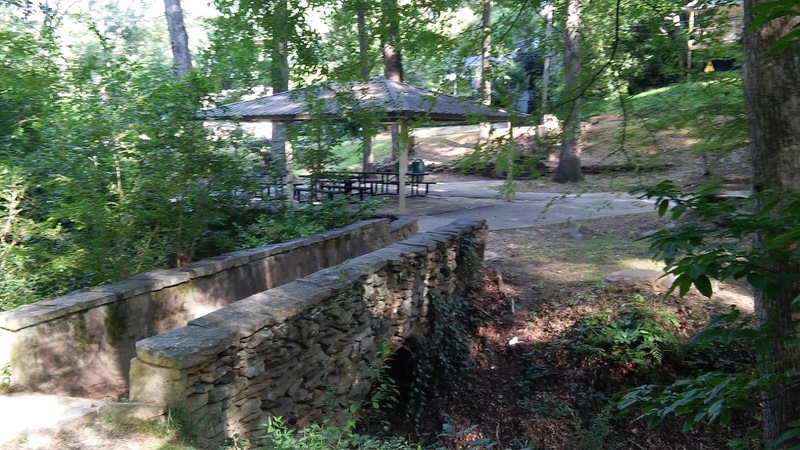 The Solar System trail is 1.8 miles long (one way), and wends its way through four parks and the Rock Creek Greenway. According to the North Georgia Astronomers Group website, 1 mile along the trail = 2 billion miles in space. If you can’t make it to Gainesville any time soon, zoom over to NASA’s website this week to check on the New Horizons spacecraft’s Flyby of Pluto (set for Tuesday, July 14). NASA has been busy the past few days sharing photos of the tiny sphere beamed in from New Horizons. Whether you still consider Pluto to be a planet, or merely a dwarf, the New Horizons flyby will give astronomers and star-gazers plenty to talk about for years to come.